I stopped in at the local library last week and this book was on display (new acquisition). The title intrigued me so I borrowed the book and completed it in a couple of days. It is fascinating reading not only because of the story line but also in the context of Quebec history. The French and Indians were allied against the British for the prize of Quebec. The events on the Plains of Abraham between Wolfe and Montcalm were in the not-too-distant future. In 1703, seven-year-old Esther Wheelwright from Wells, Maine is abducted by an Abenaki and French raiding party leaving behind her parents and siblings. She eventually ends up over 200 miles away at a Jesuit mission in Quebec from which she is adopted into the family of her native captors. Contrary to popular opinion, children were valued and well taken care of by this clan. Esther’s release was finally negotiated when she was about 12 years old but it was too late. For whatever reason, and a few a hinted at, she refused to return to her family in New England and her parents never saw her again. Later, she is contacted by one of her brothers and two of her nephews, but they also are unsuccessful in convincing her to return “home.” Apparently it was not unusual at the time for captives to remain with their new native families. Esther remained in Quebec, became a cloistered Ursuline nun and eventually rose to the rank of Mother Superior of the order as well as an influential figure in 1700’s Quebec. 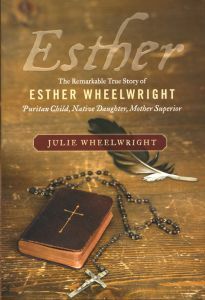 Esther’s story was known in the extended Wheelwright family – “the story handed down through the generations in my family is of a lost child who made good in French Canada, saving the Ursuline convent from closure and the nuns from exile by the British conquerors. She stands out among the unwritten lives of wives and daughters, a rare female descendant of Reverend John Wheelwright’s Puritan stock who was venerated for her own accomplishments” writes the author. Author Julie Wheelwright, a relative, has thoroughly researched the story. There is no written documentation from Esther Marie-Joseph Wheelwright de l’Enfant Jesus, her name upon taking her religious vows. However, the author has consulted a copious amount of official archives from Quebec, to the USA to London, England as well as books written about the life and times of the prominent Boston Wheelwright family. The author herself is amazed at the transformation in Esther. Her forebears were strict Puritans, against any sort of “popery” in worship. Esther, at a young age, is seen to have a vocation for a spiritual life. Influenced by Jesuit priests and Ursuline nuns she becomes a cloistered nun around the age of 18 and remains so until the end of her life at 84 in 1780. An expert on native history and professor at Laval University consulted by Julie Wheelwright said: “…There was strong pressure for Esther to become a nun. She was a spoil of war, and for the Catholics in the early eighteenth century, having any Protestant convert was a victory – but to have a little Protestant girl transformed into a nun was a huge triumph. It was the opposite of what was acceptable to Esther’s family.” Nevertheless, Esther made a success of her life as a nun and later, as the head of the Ursuline convent in Quebec City, a testimony to the human capacity to adapt and transform oneself. Significantly, at a time when other women were restricted to marriage and motherhood, Esther rose to the “most powerful religious position for a woman in eighteenth-century colonial life. This is an intriguing read. I recommend it to anyone interested in Quebec history, true-life stories of survival despite overwhelming odds and the human capacity to change, adapt and transform one’s life. Disclosure: I borrowed this book from the library. I was not compensated in any other way, nor told how to rate or review this product.